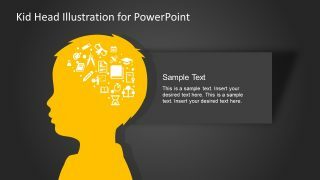 The Kid Head Silhouette Illustration PowerPoint Template is creative idea presentation containing vector shapes and graphics. The slides are prefect to showcase sociology, psychology and mindfulness among children using impressive slide design. The child welfare organizations such as UNICEF and save the children can bring awareness through this PowerPoint. Ideal for non-profit and education sector to present the research analysis to improve health and abilities. The kid head with various icons creating a brain shape also represents how child’s mind operates. 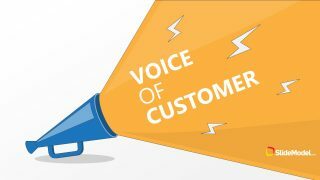 The kid head with ideas transfers the message of health, technology, experience from knowledge source. The Kid Head Silhouette Illustration PowerPoint Template contains two slides of child head. The both slides have icons making a brain shape presenting the skills of kids. For example, the yellow shape has clipart like notes, book, pen and other scientific elements. This demonstrates the children who are more involved in brainy activities. However, the second kid head silhouette contains the images of physical activities such as, bicycle, ball, music icons etc. Lastly, the two slides of PowerPoint give a variety of images to choose and add in template. 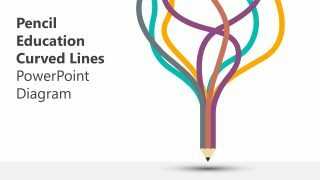 Copy the slides of silhouette illustration and add in another presentation. 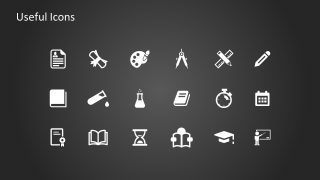 Similarly, copy any clipart available in useful icons slides to use in kid head silhouette or in different presentations. 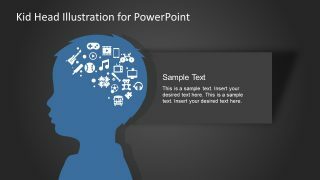 The editable PowerPoint of 4 slides kid head silhouette illustration helps users to make custom changes in the template. These edits include, recolor, resize, reposition or add more image effects like 3D and preset. 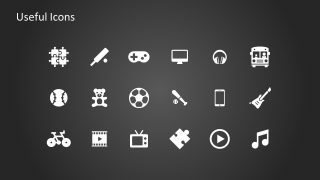 Additionally, the kid head silhouettes are vector shapes with quick-change options like fills, lines, effects and shape styles. The option of placeholders assist in adding relevant textual content. 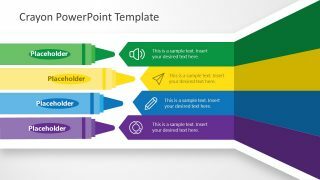 The color theme and layouts of PowerPoint template are also customizable. To alter the theme, go to the design tab and select desire color palette from variants drop-down menu. On the other hand, select layout options in home menu. The initial background of this template is black. 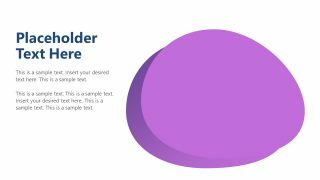 Although changing background is as simple as recoloring a PowerPoint shape.